Plus, the U.S.-Philippines will hold a six-day military drill in the Scarborough Shoal. Wednesday diplomacy links. Indian National Security Adviser Shiv Shankar Menon will travel to China on Friday to hold 2 days of talks about the disputed border. China will be represented at the talks by State Councilor Yang Jiechi, the country’s top diplomat. It is the 16th time the two countries have met to discuss their disputed border since the 1980s. State Councilor Yang is just back from South Asia where he visited Nepal and Myanmar. Japanese Defense Minister Itsunori Onodera arrived in the Phillippines on Wednesday for a two-day visit aimed at strengthening defense cooperation between the two nations. He will visit the former U.S. naval base at Subic Bay before meeting with his Filipino counterpart, Defense Secretary Voltaire Gazmin. Late next month Japanese Prime Minister Shinzo Abe intends to visit the Philippines, Malaysia and other ASEAN nations. 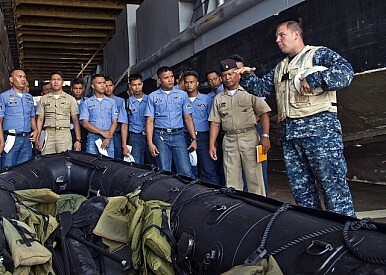 On Thursday, U.S. and the Philippines will begin a 6-day military drill near the near the Scarborough Shoal Island. According to The Philippine Star, Manila is sending one ship and 500 personnel for the exercise and the U.S. is sending four ships and 500 men. China is urging caution. During the visit Sang will meet with meet with Indonesian President Susilo Bambang Yudhoyono. A number of bilateral agreements are expected to be signed. The visit comes on the heels of Sang’s visit to China and before the ASEAN Regional Forum on July 2. After arriving in Afghanistan over the weekend, U.S. Special Representative on Afghanistan and Pakistan, Ambassador James Dobbins, traveled to Islamabad on Tuesday to meet with Prime Minister Nawaz Sharif. The two discussed bilateral ties as well as the Afghan peace talks between the Taliban and the Afghan government in Kabul. U.S. Secretary of State John Kerry recently postponed a trip to Pakistan to deal with Syria, but the U.S. State Department says it will be rescheduled for some time next month. From Pakistan, Dobbins traveled to India on Wednesday to brief Indian officials on Washington’s engagement of the Afghan Taliban, which has reportedly unnerved India. Japan and the European Union began their second round of negotiations over a Free Trade Agreement in Tokyo on Monday. The talks will last through July 3.